Denim lovers everywhere know the importance of mixing up their favourite casual looks with new denim washes and shades, and this season the spotlight is on coated jeans. Create drama with wet look black skinnies, or choose a light grey baggy pair over classic chinos. The polished sheen on coated jeans makes these off-duty wardrobe staples a little more luxe than your average denim, letting you wear them on a night in the city or even on a dressed down Friday at work. Black bootcuts look great when paired with a linen shirt and pointed black men's brogues or lace-ups, accessorising with a sleek leather messenger bag to keep them contemporary. Skinny black jeans are always in style, transforming their aesthetic completely with a slogan jersey tee during the day to a silk top and statement necklace for drinks at eight. Roll up your light blue boyfriend coated jeans when breaking out your white adidas Stan Smiths, pairing with a relaxed white blouse to push the boundaries of smart casual style. Make summer style last all year long with indigo blue coated jeans with tonal espadrilles and a lightweight printed long sleeved t-shirt, layering up with a statement sweatshirt when the weather turns cooler. Through the transitional seasons, coated straight legged jeans and ankle boots are where it's at, covering up with a tartan cape or leather jacket to keep warm. 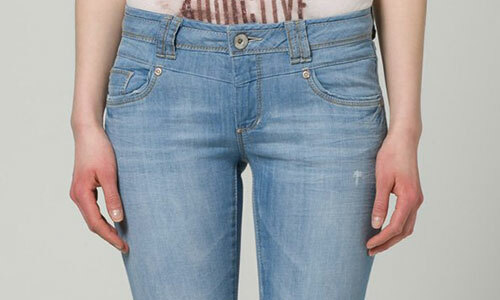 Acid washed jeans are treated with chlorine to give them a rough colour texture. Their popularity in the 80s makes them ideal for a vintage look. The more worn the better! Faded jeans give the appearance of a much loved worn pair of jeans without having to put the hours in wearing them in. 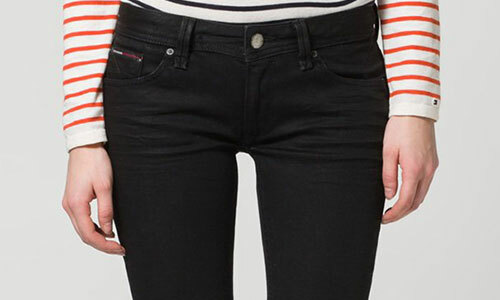 Black jeans defy the "no jeans" rule, passably chic when the event calls for more sophistication. They are also extremely versatile, flattering and easily combinable. Bleached jeans are chemically treated, featuring either large splashes of contrast colour or an overall bleached look. The original, blue jeans were invented by Levi Strauss back in 1853. Blue jeans are the most popular type of jeans in the world today and are characterised by their indigo colour. Coated jeans are an example of a newer denim trend. Their shiny texture appearing almost like leather, they are also suited to more chic occasions where blue jeans might not. Distressed denim is characterised by holes, tears, rips and rough textures. Chemical treatment such as bleaching is also often used to further the "distressed" look. Raw denim jeans are made from untreated denim that is not washed after dying. These jeans will gain unique character with age as they naturally fade. Stone washed jeans are traditionally tumbled with pumice stones to create a faded appearance. The abrasion caused by the stones means new stone washed jeans come complete with character. Ripped jeans are those that have numerous holes and tears as well as distressed elements. They are characteristic of the rebellious punk style. Vintage jeans are not made to look old - they are genuinely aged! Hand me down from older relatives or friends and charity shops are the best places to get your hands on these. White jeans can instantly lift an outfit, making them perfect for summer! Good for those who can't bear to part with their denim all year round.